Type right inside the block or copy and paste some text. Use the editing options that appear on the right to edit the way the text looks. How do I add text to a page? Add text by double clicking on ‘Aa’ or drag it onto the page. A text block will appear. Click inside of the text block to start typing. What is a good font size? A font size that works on a screen is different from a font size that word in printed products. De size also depends on the type of font used. Tip: Just to be sure, you can print out a page to see if the size you’ve used is legible once it has been printed. How can I add text columns to a page? Text on a page in a magazine is often divided into columns instead of being spread out over the whole page like in a letter. If you select a text block, you are able to choose for columns on the right side of the page. With this you can divide the text inside the text block in multiple columns. Not all text inside the text block is visible. What caused this? If you can no longer read the text at the bottom of the text block, then the text block is not long enough. At the bottom of the text block red arrows will appear in between the blue squares. You can enlarge the text block by pulling down the blue squares. You can also make the text block wider or make the font smaller. I can’t copy and paste text from Word. What do I do? Copying and pasting text from Word to Jilster doesn’t work if you are working with Safari. The best thing you can do is to paste your text in TextEdit, then copy your text from TextEdit and paste in Jilster. You could also use Mail instead of TextEdit. Another possibility is to use a different browser, like Chrome of Firefox. These browsers don’t give any problems with copying and pasting from Word. I can’t add any accented letters to my text (for example: é, ë, ï, ê). How can I fix this? If you are working on an Apple computer, you can type the letter or word in TextEdit (Apple’s standard text editor) and copy and paste the letter or word from TextEdit to Jilster. You can also use Pages of Mail instead of TextEdit. A streamer is a short text of around five to fifteen words. Choose a striking sentence or quote from your article for this. Choose a big font for the streamer to make it stand out more. The function of a streamer is to make the reader curious, to stimulate the reader to read the whole article. This is why striking quotes or sentences are used as a streamer. Some fonts are smaller than other fonts but the font size is the same. How is this possible? This is caused by your chosen font. The fonts differ in size. One font can be smaller than the other using the same font size. I can’t edit some texts from the templates. What can I do about this? On the front page of the Birthday magazine #1 are letters that spell out HOORAY. It is not possible to change these letters like you do in a text block. This is because the letters are images. Images can be put outside the outer dotted line, so that the images are cut off on the edge/margin of the magazine. This is also how it is done on the front page of the magazine LINDA.. If you want to change the letters, you can delete the images of the letters and select different letters at ‘images – theme – letters & numbers’ to put on the page. We have black and white letters and numbers. Watch out/Take note that you have to use the blue squares to change the size of the letters and numbers. You can check the height at the right side of the screen to see if all your letters or numbers are the same height. Put the letters about 4 pixels outside the outer dotted line at the side and at the top. This way you can be sure that the letters will be cut off for a small part. Use of the font ‘Walkway’. If you use the font ‘Walkway’, make sure to make the font bold. If you don’t make the font bold, the letters will be too thin to be properly printed. Can I use emojis in a copied text? No, this is not possible. The different fonts in Jilster do not support the use of emojis. The page won’t be saved the right way and can’t be shown after this. 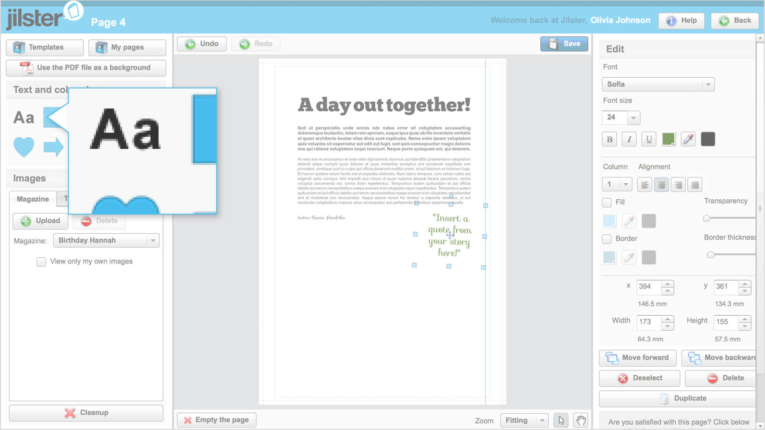 We advise copying texts without mock-up and pasting into a text block on a page in Jilster. How do I choose a color that is the same as a color from an image? You can do this by using the pipette in the right column at ‘color’. This way you can give the letters or colored surfaces the color from the image. Select the text or the colored surface, click on the pipette and click on the part of the image that contains the color you want. Can I use my own color? Yes, you can. If you click on the icon for choosing a color and the palette is shown, you can type in a color code. The color code is a combination of 6 characters (0-9 and A-F). Press ‘enter’ to activate the color code. How can I give my colored surface a matching color? If you stand on a colored surface with your mouse, buttons will appear in the right column to change the appearance of your colored surface. Using the icon of the pipette, you can give the colored surface the same color as the color from an image. Select the surface that you want colored and click on the icon of the pipette in the right column. Next, click on the part of the image that contains the color you want. For example, the red sweater your grandfather is wearing in a photo of him. If you click on the sweater with the pipette, the surface will become the same color as the sweater. How can I reuse a colored surface on a page? You can reuse a colored surface (or any other element) by duplicating it. You can do this by clicking on the button “Duplicate” at the right side of the page. I would like to add a line to my page. Is this possible? Choose a square colored surface and make this as thin as a line. You can do this by changing the height or width in the right column until 1 pixel minimum. It is also possible to rotate the surface by moving the blue circle at the top of the surface. Type a line in a text block (using — or ___). Make the text block as long as it needs to be. You can also rotate the text block by using the blue circle at the top to get a vertical line. Will all colors I see on my screen be the same when the magazine is printed? There may be a small difference in color between what you see on screen and how the same color looks in the printed magazine. This has to do with the structure of colors on screen (RGB) and the structure of the ink that is used to print (CMYK). In most cases, there won’t be much difference in color, but some colors, fluorescent colors for example, can’t be made with ink and will be a little different from the color shown on screen. It is also good to know that each screen is different. Colors may appear differently on one screen compared to on another screen. What are the dotted lines on the page? The dotted lines serve as important guidelines for text and images in your printed magazine. The outer dotted line is the cutline. The inner dotted line ensures your text will be clearly visible. For full-page images: place the image outside the outer dotted line. Placing the image exactly on, or inside the outer dotted line may result in a white border. Please note: when working with PDF files always make sure the text is inside the inner dotted line. Can I crop images or change the shape of images? Unfortunately, it is – not yet – possible to crop images or to change the shape of images. You can crop your image with another program before uploading it to Jilster. After this, you can upload your photo and put it on your page. You could also use another website to change your photo or to change the shape. Another option is to hide parts of the photo behind colored surfaces that are the same color as your background. The quality of the image/photo seems inadequate. Why is this? The quality of the photos or images on screen isn’t the same as the true quality. This is because we use smaller images in the editor to make sure it works fast. When your magazine is printed, the highest quality available of your image is used. What is the minimal quality my images/photos need to have? If you select an image, the yellow stars (in the top right corner) will show you the quality of your image. Four yellow stars is the optimum quality. Two yellow stars still give a beautiful result. The print won’t be beautiful anymore with less than two yellow stars. To get images of optimum quality (four yellow stars) if you use them to fill in the whole page, you need images with the minimum resolution of 2575 x 3600 px. Scan photos with a minimum of 300 dpi. If you want to enlarge them, you have to use a higher resolution. You can upload images/photos as jpg, png, bmp and gif. Jpg is preferable. You can only use a pdf as standing A4 format and page-filling. Choose ‘use pdf as background’ in the left column. 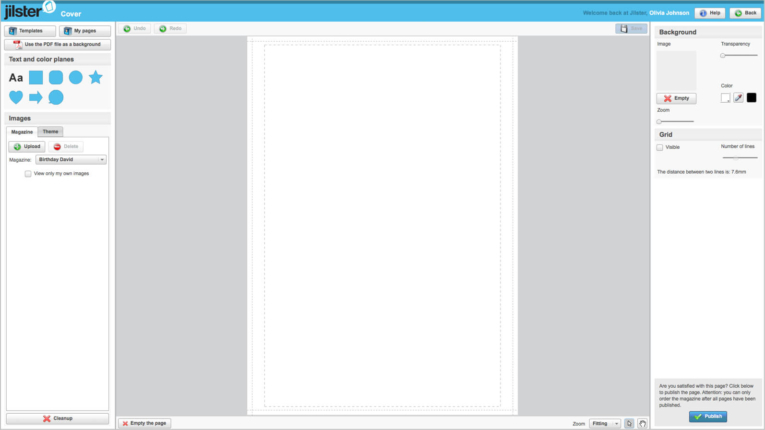 You can put text blocks, colored surfaces or images on top of the pdf background. An error message appears when I want to upload an image/photo. What do I do? Your internet connection could be the problem. Try uploading again later and it might work then. If the solutions above don’t solve your problem, send an email to customer service. Please let us know which solutions you have tried and what is going wrong, then the customer service will find a solution. Uploading photos goes very slowly sometimes. Why is this? Because you are working online in Jilster, the high quality photos have to be moved from your own computer to the Jilster server. If you are uploading a lot of photos at the same time, this can take a while. You could possibly upload less photos at the same time. A powerful computer and a fast, stable internet connection are important when you are working in Jilster. The higher the upload speed, the faster your photos will be uploaded. You can check your upload speed here. A minimum upload speed of 10 Mbps should be enough. Is it possible to put a photo on two pages next to each other (spread)? Firstly, create the left side of the spread by opening a page with a even number (2, 4, 6, etc.). Upload the lying photo, put this on the page and stretch it (by using the blue squares above, left and beneath the photo) until the left side of the photo fills the page completely. Move the photo until you only see the left side of the photo on the page. Put it just so that you don’t see any piece of the white background anymore. Remember the spot in the photo that is on the right outer dotted line. Save the page, write down the numbers of the y-axis, width and height, and close the tab. Open the next page with an odd number (3, 5, 7, etc.). Put the same photo on the right page. Type in the same numbers for the y-axis, width and height. Then move the photo to the right and make sure the spot you see on the left outer dotted line, fits with the spot you remember from the other half of the photo (on the even page). Save the page and close the tab. Check if the two pages correspond by clicking on ‘example’. I have an image as pdf file. How can I use this? 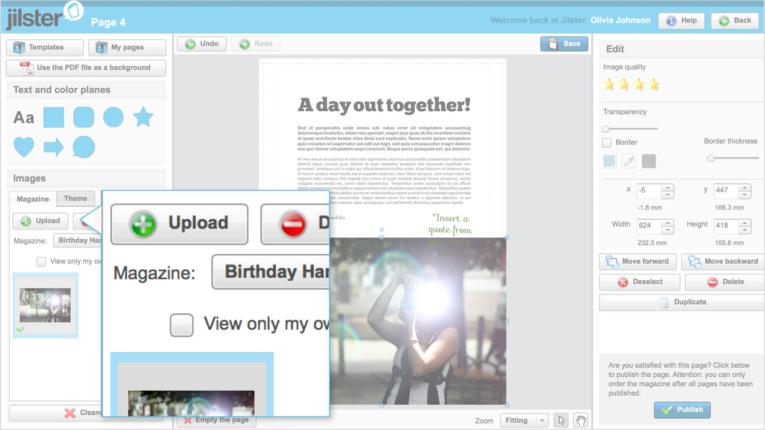 You can upload photos or images as jpg, png, bmp and gif files in Jilster. Preferably choose a jpg file, because you will be able to make this file bigger of smaller. 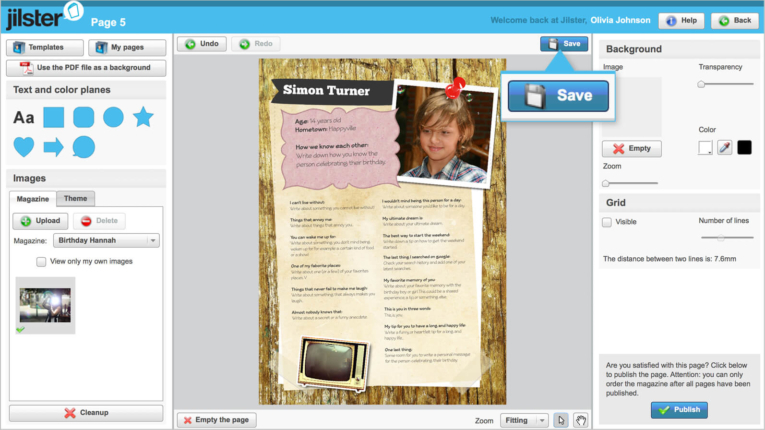 You can also use a pdf file (standing A4) to fill a whole page. If you have a smaller photo, then convert your photo from pdf file to jpg file. Copy your photo from Adobe Reader by clicking on it. Click with your right mouse button and choose for ‘copy image’. Paste the image in a graphic program such as Pain or Photoshop and save the photo as jpg file. I have images in bitmap format. How do I convert these to .jpg or .png? Open the image in a editing program (Paint for example, this is a standard program on any Windows PC, or Photoshop). Click on ‘File’ and next on ‘Save as…’. Choose for ‘JPEG’ or ‘PNG’ at ‘BESTANDSTYPE‘ at the bottom. Click on ‘Save’. The new file can be uploaded in Jilster. Is it possible to move several photos and colored surfaces at the same time? Yes, that is possible. Keep the Shift button pressed in, select the images (or images and colored surfaces) and move the whole package at the same time. Am I allowed to use any image from the internet in my magazine? The person who made the images/photos owns the copyright on these images/photos. It is not allowed (for commercial use) to use images or photos of others in your magazine. However, you can ask the person who made the image/photo if you can use the image/photo in your magazine. There are also lots of websites with images and photos you can download royalty-free (stock photos). Is it possible to reuse your own templates or pages? We advise to create templates in a separate magazine. 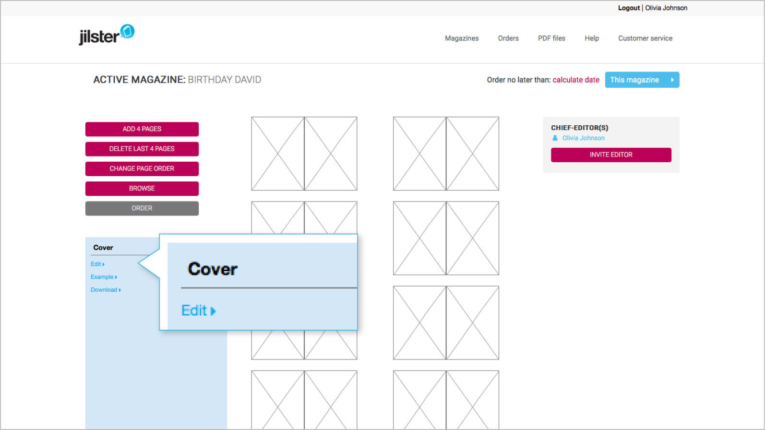 This is especially useful if you want to give multiple pages the same basic lay-out or if you are planning to create a magazine in a certain lay-out more often. 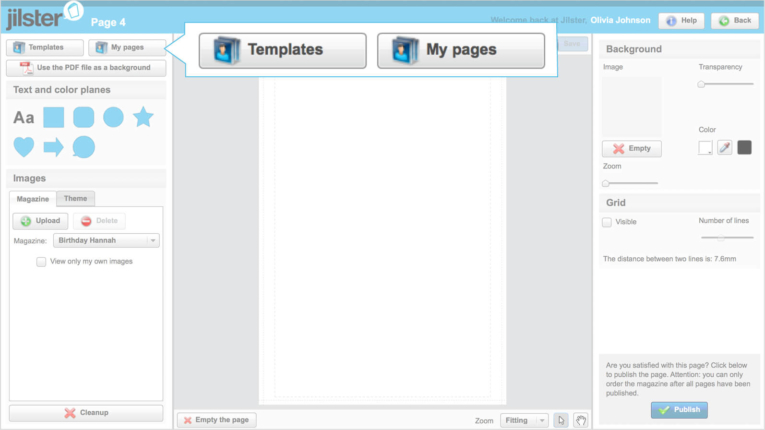 To use your own templates: Edit the page on which you want to paste your template and click on the button ‘own pages’ in the top left corner. Then select the page you want. How do I copy the lay-out or content from one page to another? 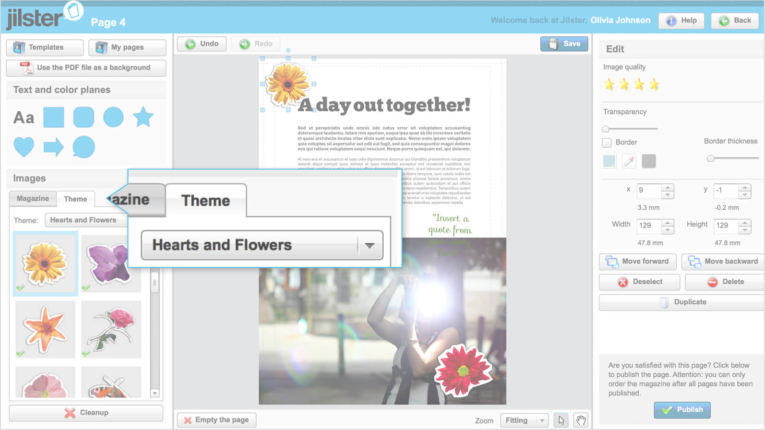 Open the (empty) page on which you want to use the lay-out and click on ‘edit’. Click on ‘my pages’in the left column. Select the page you want to copy and click on ‘use this page’. Can I copy a page from an older magazine I made? Open a new blank page in your new magazine. Click on ‘my pages’ in the top left corner of the editor. How can I change the background image of a template? Click on the background you want to change. Click on ’empty’ in the right column. Drag the image you want to the block with ‘image’ in the right column. I want to remove a text block or image from a template, but I am not able to select it. How is this possible? A template is often built up out of several layers of images and colored surfaces. The reason you can’t select the element you want to remove is most likely that another layer is placed on top of it (for example: a text block or an image). To select the element you want, you have to move the top layer first. For example, you can move this layer to the side, so you are able to select the element beneath. Are the images used in the templates also available to use on their own? You can find all sorts of images and pictures you can use in the left column of the editor under ‘images’, under the button ‘theme’. You can also find the images used for the tempaltes here. The images are arranged by theme, such as animals & farming, objects, party, symbols, etc. Can I use a PDF for the background? 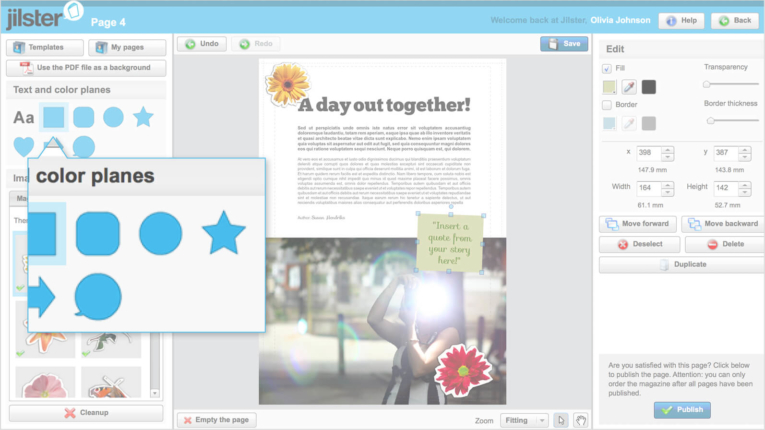 You can add element like text blocks, colored surfaces and pictures to a page. It is not possible to edit the pdf on the page. You can zoom in on the pdf. This way the pdf will be bigger on the page. After this, you are able to move the pdf on the page. Can I create pages in Illustrator, Photoshop or InDesign and use these in Jilster? 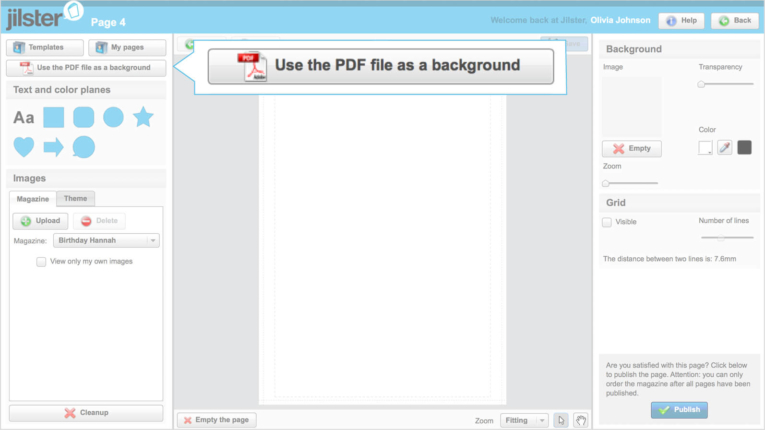 Yes, you can do this by saving your file as pdf and then uploading the file in Jilster. 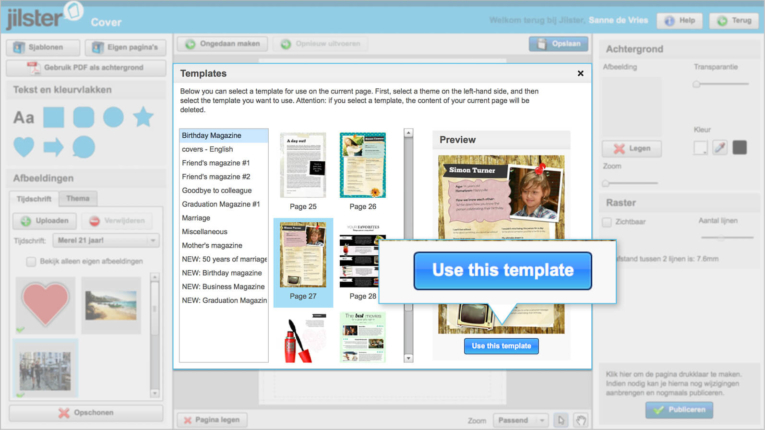 You can copy your pdf page per/for page to your magazine. The quality of your pdf stays the same. 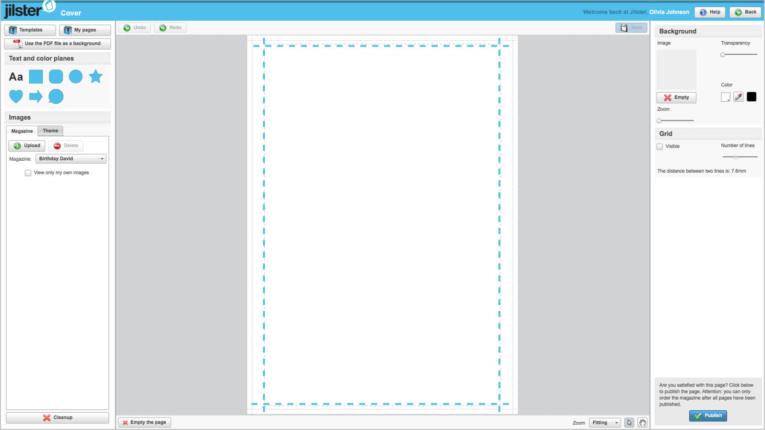 The page of your pdf is used as standard A4 format + 4 mm cut at the edges. In the graphic program you can best use a format of 218×305 mm. Take account of a possible cut at the 4 mm edges (the exact cut depends on the number of pages). Tip: If you are saving your file as pdf in Illustrator, you should turn of the Marks under ‘Marks and Bleeds’. What are the requirements a pdf has to meet? A pdf will always fill up the whole page. Make sure there is enough room at the edges of your file at the snijranden. Around 4 mm will be cut off at the edges of the page after your magazine is printed. The dotted line on your screen shows where the cut will be. We advise a format of 218×305 mm for pages made in a graphic program. You could also save a Word file as pdf and use this to fill your page. Make sure there is enough room at the edges of the page for the cut. All text has to be within the inner dotted lines if you want to be sure it is legible! What are the exact measurements of the pages? We use an A4 format (210×297 mm) with a 4 mm edge on all sides: that makes the format of a page 218×305 mm.